And from those words, a challenge was born — to make a Pisco cocktail using eggplant that even Fermina Daza would fall in love with. Much of the inspiration on how to solve this cocktail challenge came from one of the recipes in Good Things to Drink, by Ryan Chetiyawardana, the creative force behind two of my favorite bars in London — Mr. Lyan and Dandelyan. 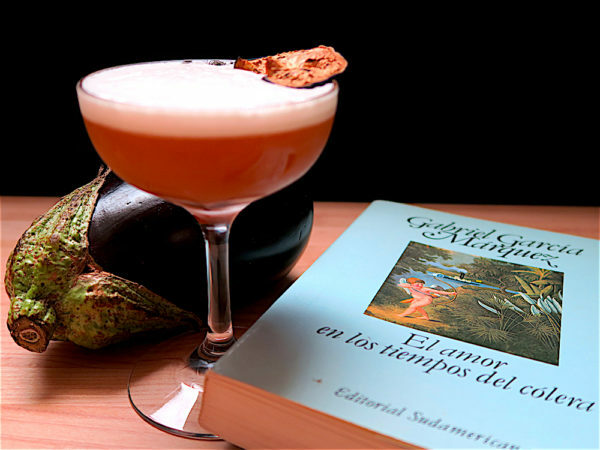 While browsing his book, I came across a rum sour that was made with an eggplant purée and baked eggplant chips, and immediately thought of Fermina Daza and her profound aversion to eggplants. Presenting, Pisco in the Time of Cholera, a Pisco cocktail that pays homage to all the types of maddening and romantic love that Fermina Daza and Florentino Ariza shared during their life together. Combine the Pisco, Lillet, lime juice, syrup, and egg white in a shaker with ice. Shake vigorously to create a creamy foam and strain into a chilled coup. Garnish with a dehydrated savory eggplant chip. One medium eggplant is cooked two different ways for this cocktail. First, cut the eggplant in half lengthwise, then place each piece cut side down and slice into thin half circles. Toss about 3/4 of the eggplant half circles in a bowl with 2 tablespoons of olive oil and 1/2 teaspoon salt, then place the eggplant half circles in a dehydrator on a high setting for 5 hours or until the eggplant half circles turn into crispy chips. Place the other 1/4 eggplant half circles on a baking sheet lined with Silpat and sprinkle with 2-3 pinches salt and turbinado sugar, then bake at 325°F for about 40 mins, carefully turning the chips over after 20 mins. The dehydrated chips are used as garnish for the cocktail and the baked chips are used for the sous vide maceration. To make the Pisco maceration, I used a Sansaire sous vide machine and a mason jar filled to the brim with 1 cup of Barsol Quebranta Pisco and 5 baked eggplant chips. The sealed jar was submerged in a water bath at room temperature, and the target temperature was set to 75°C. Once the target temperature was reached, I removed the jar from the bath. After letting it cool, I opened the jar and strained the Pisco into another airtight jar. To make the raw sugar syrup, mix 1 cup raw turbinado sugar with 1 cup water in a small pot, and heat the mixture, stirring, until the sugar dissolves. Pour into a mason jar and let cool before using.